For the past few years, more and more E-Cranes have been popping up in South America to handle grain. A few months ago, we discussed a several E-Crane installations taking place in 2014 and 2015. All of these machines are successfully up and running, and a new E-Crane installation is set to take place in the autumn of 2015. The E-Crane is ideal for bulk handling applications that require heavy-duty production cycles and has proven to be a top solution for grain handling operations involving barge unloading, shiploading, and midstream transfer. In 2014, a 1500 Series/Model 11264 E-Crane was commissioned for CHS in Zarate,Argentina. CHS is a leading company in agribusiness with locations all over the world. The E-Crane is dock mounted, and is used to unload soybeans and grain from both Mississippi and Parana´ sized barges at the CHS facility in Zarate. The E-Crane transfers the material from the barges to a hopper and conveyor system located on the dock using a 14.0m3 (18.3yd3) hydraulic clamshell bucket. This was a greenfield project, with all new equipment, in order to expand operations at CHS. CHS contacted E-Crane back in 2013, looking for a solution to offload grain barges. E-Crane engineers worked closely with CHS to determine the best possible setup. E-Crane service technicians were on site in Argentina for the E-Crane installation, training, and commission to make sure that operations were successful. Also in 2014, UABL realized the benefits of the E-Crane for grain handling with the installation of two 700 Series E-Cranes. UABL, a subsidiary of Ultrapetrol, owns and operates river terminals and provides barge and terminal services across South America. In 2014, the order was placed for two E-Cranes mounted together on a single barge. Both E-Cranes work together to unload grain from Parana´ sized barges into two separate hoppers also located on the barge. The hopper outputs the material onto a conveyor/ship-loader system which transfers the material into Handymax sized vessels on the other side of the crane barge. The E-Crane solution is ideal for situations that require floating equipment such as this. The E-Crane's balanced design is based on a parallelogram style boom which provides a direct mechanical connection between the counterweight and the load. Because of this, the E-Crane remains in a near perfectly balanced state throughout its entire working range. This results in significant energy savings, allowing gravity to work in the E-Crane's favour, but also makes the E-Crane ideal for mounting on a floating barge. Because the E- Crane is balanced, the movement of the E-Crane causes very minimal listing and movement of the barge. A barge-mounted E-Crane is beneficial because it floats up and down along with the material barges as the water elevation changes. This means that the cycle of digging material out of the barge is never affected by water fluctuation. The E-Cranes were installed on schedule in 2014, and commissioning and training took place in the summer of 2015. Commissioning took place several months after installation due to delays with other grain handling equipment for the barge. The E-Cranes are now up and running successfully! In 2015, an order was placed for another E-Crane to offload grain barges near Santa Fe,Argentina. The E-Crane is a 1500 Series/Model 10290 with 29.0m (95ft) outreach and 14.0 metric tonnes (15.4 US tons) duty cycle capacity. The project will be similar to the previous CHS installation and the E-Crane will be used to offload grain from Parana´ sized barges into a hopper on shore. E-Crane has proven itself as the ideal solution for grain handling and hopes to continue to expand throughout South America. Specifically designed for barge unloading processes, anything from coal to limestone to fertilizer to grain to scrap steel can be handled with the E-Crane. The E-Crane is a truly versatile machine in that it can easily switch between commodities and still offer the high production required at many ports and industrial facilities. Built for 24/7 duty cycle operation, E-Cranes have unprecedented life cycles, high efficiency, and low maintenance costs. The standard E-Crane product line consists of several series of balanced hydraulic cranes (Equilibrium Cranes): 700 Series, 1000 Series, 1500 Series, 2000 Series, 3000 Series, and 5000 Series. E-Cranes provide longer outreach and higher duty cycle capacities than typical material handlers. Outreach ranges from 24.8 to 50.0 metres (82 to 165 feet) and lift capacity ranges from 5.5 up to 60 metric tonnes (6 to 66 US tons). All over the world grain is counted as one of our most valuable staple foodstuffs, writes Meike Kettler,Team Manager Marketing Communications, Business Area Grain Logistics, Buhler GmbH. In the light of a growing world population and climate change, safeguarding this raw material is one of the challenges of our times. In addition to the monitoring of cultivation itself, handling after the harvest is also a critical factor in relation to quality assurance and the reduction of raw material losses. For Buhler’s Grain Logistics business unit, everything starts once crops have been harvested. After the combine harvesters have done their job, grains and oilseeds are brought to silo plants for storage. Two of the fundamental elements of initial storage are cleaning and, in many cases, drying of the grains prior to storage. In an age in which the demand for grain is steadily increasing, Buhler’s expertise in the field of post-harvest technology has become essential. Whether the need is for grain silo installations, or a grain terminal, Buhler Grain Logistics provides a complete service portfolio from consultation to customer service. The scope of delivery includes cleaning and grading systems developed in- house, energy-saving continuous flow dryers developed especially for use with grains, as well as a full range of conveying and dedusting systems. With its knowledge and services, Grain Logistics sees to it that post-harvest losses, which are still occurring at an immense rate globally, are further reduced and that fewer commodities go to waste. 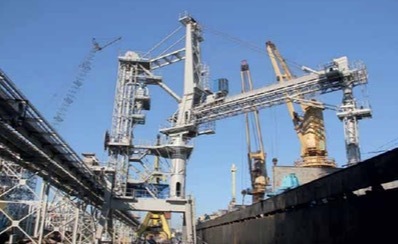 Ship and vessel loading and unloading installations supplied by Buhler enable shipping from large-scale silo plants in the growing regions to consumers worldwide. Technology for temporary storage or direct loading onto barge, rail or truck for onward transport is also supplied by Grain Logistics. Grain Logistics offers services from A to Z — from planning, construction, manufacturing, delivery and start-up through to on- site training of personnel and dependable customer services. Together with Buhler’s other business units, Grain Logistics provides Buhler customers with solutions for the entire value- added chain — from the field to the finished food product. Countless tonnes of agricultural commodities are transshipped every day around the world — and the requirements to be met by the grain collection facilities and cargo handling terminals involved are growing. The overriding priority here is to use the latest technology to prepare every last grain of cereal for storage and processing as gently and economically as possible. These processes require considerable specialist knowledge of the systems and products. Grain Logistics offers all the process stages from a single source, meaning the complete package, namely the planning, development, construction and maintenance of anything from individual components to complete systems — anywhere in the world. Working closely together with the customer, Buhler develops, plans and constructs customer-specific plants from standardized components. With regular servicing and genuine spare parts from Grain Logistics Customer Service, the plants can offer decades of reliable service. Rice in Bangladesh. This emphasizes its success and position as the first choice technology partner for rice processing and reprocessing. The paddy processes require considerable specialist knowledge of the systems and products. Working closely together with the customer, Buhler develops, plans and constructs customer-specific plants from standardized components. Every day, billions of people use Buhler technologies to satisfy their basic needs for food, mobility, or communication. With its industrial process technologies and solutions, the company makes a significant contribution to feeding the world’s population while focusing on food safety and security. Around 65% of the wheat harvested worldwide is processed into flour on Buhler mills. The company’s contribution to the global production and processing of rice, pasta, chocolate, and breakfast cereals is equally substantial. Furthermore, Buhler is a leading solution provider of die casting, wet grinding, and surface coating technologies, with a focus on applications in the automotive, optics, electronics, printing, packaging, and glass technologies. The solutions provided to these industries are characterized by high energy efficiency and sustainable mobility. As a leading technology group, Buhler invests up to 5% of its turnover in research and development every year. Buhler is proud of its Swiss roots, with 10,600 employees at some 140 sites generating sales of CHF 2.3 billion. As a family-owned company, Buhler feels particularly committed to sustainability. When it comes to uniting with a strong partner for handling goods and bulk cargo, Kocks and Ardelt have always been pioneers in innovation and providing customized solutions to address individual customer needs. Kocks and Ardelt are members of Kranunion, an association of three leading crane manufacturers specialized in lifting, transporting and handling heavy loads for railways, ports, shipyards and steel mills. Kranunion operates worldwide and has representation in North and South America, Asia and Europe. Kranunion stands for high quality professional German engineering. During the last five years, Ardelt has delivered more than seventy slewing cranes to twenty-two different countries. The delivered cranes cover a wide range of applications and are geographically spread from the polar region in the north to the far reaches of South America. Ardelt offers premium cranes that meet the demands of the great variances in site conditions as well as the different local requirements and regulations. Ardelt continuously utilizes its vast expertise and knowledge to introduce and improve technologies for handling bulk cargo. Ardelt Grab Filling Optimization, the improved Anti-Sway Control System as well as many other application-specific (or customer- specific) systems are only a few examples of Ardelt’s innovative capabilities. Louis Hagel GmbH und Co. KG of Hamburg, Germany, as the oldest operator in the port of Hamburg, has recently added a new stationary Tukan manufactured by Ardelt; the crane was operational just in time for the 2014/15 season. Louis Hagel is a specialist in handling fertilizers, salts and other bulk goods. To serve its operations, the new double jib level luffing crane has a maximum outreach of 36 metres and the maximum lifting capacity is 12 tonnes. In terms of serviceability, the Tukan is equipped with the latest technology: touch-screen monitors, supervision cameras and semi-automatic operation allowing the crane operator to not only work more easily, but also ensure greater safety. Since the year 2000, slewing cranes from Ardelt have been equipped with an Anti-Sway Control System; this system is subject to continuous development and improvement. The advantages of this system are based on an advanced control process that makes optimal fine positioning during manual operation possible. As a result, a smooth transition from manual operation to semi-automatic movement is possible, even with load sway. Louis Hagel reaps the rewards from this system; the manual control used over the ship merges smoothly and without any delay into the automatic operation for unloading the bulk goods into hopper. Due to the rapid and efficient bulk handling into the covered conveyor belts, Louis Hagel minimizes the environmental impact, such as humidity, on the handled goods while at the same time achieving maximum handling throughput. The patented, and in-house developed, Grab Filling Optimization Technology is used in all Kocks and Ardelt bulk handling systems. Cutouts (stoppage) due to grab overload are a thing of the past — with Ardelt grab technology, handling productivity is maximized and the grab capacity is utilized to the maximum values relating to the various material properties. In Chile another testament to the quality of Ardelt double jib level luffing cranes is in operation, a Tukan 750 that is used for handling agro bulk. The customer, Puerto Panul S.A., is responsible for the development, maintenance and commercial operation of the docking side of the north terminal in San Antonio port; the agricultural imports that are handled at this port are mainly wheat, corn and soya. The current Tukan replaces an old and smaller crane (from another manufacturer), that collapsed during an earthquake in 2010. The Tukan does not only meet the technical and operational requirements of the port, but also fulfils the very demanding standards for earthquake- prone regions. This special Tukan had to be installed in a rather challenging location, a ‘finger pier’. The peculiarity of the location had called for special logistics and assembly solutions, further examples of Ardelt’s position as a true custom-solutions provider. For the assembly work to be carried out in San Antonio, the crane parts were delivered in big sub-assemblies. The erection of these crane parts was done with the support of a giant lattice boom crane; the erection was completed in only seven days and the port remained fully operational during the whole process. Kocks and Ardelt deliver highly professional cranes for bulk handling all over the world. All of the products are centred around ingenious technical concepts, which are steadily developed. Thinking one step ahead on the customer’s behalf has made it a world market leader; it always seeks to provide the best possible life-cycle costs, maximum operating benefits and lowest environmental impact. Major bulk handling equipment provider offers a wide range of equipment for the bulk industry. Included in these products is a range of grain handling equipment, used for the loading and unloading of vessels (barges/ships) at ports and terminals with capacities of approximately 120,000BPH (bushels per hour) (~3,000tph [tonnes per hour]) loading/unloading rates. This equipment is used for the unloading barges or ships to transfer grain to smaller vessels or to storage facilities, usually silos, or the loading barges or ships from larger vessels to smaller ones or from storage silos to the vessel. The major grains handled by Metso equipment include corn, wheat and soy. However, the company has also handled cotton seed, rice, brewers grain, animal feed and even coffee beans and peanuts. Metso works with most of the major grain companies. Metso manufactures its equipment at a specific set of pre- qualified shops in North and South America, Europe, China, Australia and various other countries, all of which are Metso- approved facilities. Typically the equipment used for unloading and loading in grain handling is stationary and is assisted by the use of a haulage system to move the vessels to facilitate the unloading or loading process. Metso has additionally supplied numerous grab unloaders, as well as, ship and barge loaders that travel along a dock, in lieu of using a vessel haulage system. As a general rule, Metso uses advanced systems to power its equipment, which utilize AC motors integrated with variable frequency drive controllers. It can, however, provide any power system required as it customizes its equipment to meet specific customer needs. All of Metso’s equipment can be customized to suit very specific customer requirements. Even its standard product offerings can be customized, although these are more generally sized and standardized for a cost-effective solution. Grain is grown and harvested in many regions around the world. It is then transported by rail, barge or truck depending on location and cost of transport. Inland river shipping terminals, bulk transfer terminals, and import/export terminals provide a viable means of moving the bounty to market. Metso is prominent in each of these locations, as well as at customer processing facilities where its line of standard equipment such as en masse conveyors, rail car movers, rotary bin dischargers and flingers are utilized. many years. However, its primary area of equipment supply has been in mining, moving ore and minerals, as well as supporting coal-fired electric power. Adapting to the global market changes, Metso is now re-emphasizing its focus on other industries, such as the grain industry. The company continually invests in R&D and equipment, and this investment includes grain handling products. Metso is currently putting effort into re-inventing equipment to address different markets. Metso takes great pride in providing cost-effective, high quality, easily maintainable, safe equipment for its customers. It continues to build on these fundamentals through its renewal and R&D efforts that allow them to provide optimal solutions for customers. For the future, Metso will continue to maintain its current customer base and to grow that base through increased market share by renewing and developing its technologies that provide optimal solutions for the many industries it serves. Metso is re- inventing its bulk materials handling marketing direction to adapt to the global changes. It is not getting older — just better! The final step in the grain exporting process is the loading of the ships. The grain normally comes from a storage area using various conveyors to reach the shiploader. Using gravity, the shiploader loads the grain inside the vessel’s hatch. These systems were very popular in the past because their low equipment weight with respective low costs.The main objective was to fill the hatch.The problem with the difference of weight between weighed and really dispatched product was also neglected.The grain speed reached the maximum at the end and was used to throw it under the hatch. In the past environmental protection was not an issue as today.The dust emission depends on the volume, wind, location and loaded products. Examples of these systems include vertical or inclined falling spouts, loading rotating spoons and jet slingers. Today, there is a requirement for dust-control measures, not only in developed countries but worldwide. These are needed to protect the environment, and have resulted in developments in loading bellows with ‘skirts’ and ‘chokers’. These systems have worked worldwide with varying degrees of success. They were accepted because, when they were introduced, they were considered state-of-the-art, and they can work well depending on the type of product being loaded, its dust content and constant flow. The problem is that it is necessary to get a constant speed, specifically at the end of the loading pipe when product falls from a height of 20m. To achieve more efficient dust suppression, the product speed must be slowed down at output. Most of the systems can handle some products but not all, especially with flow and product variation. The chokers tried to slow the material with more or less complicated systems to control the flow. The result was not always positive. In our understanding two systems today are providing the required low dust emission with respective speed reduction; the cascade system and the controlled flow head. Both of these systems reduces the grain speed in order to avoid dust generation. Both also reduce the breakage of the product result of the low speed. NEUERO, the manufacturer and developer of controlled flow head perfected it allying the Kick In Kick Out (KIKO) movements. KIKO movement provides following extra advantages: besides excellent dust suppression, low material breakage and less wear it also combined with the kick in kick out movements to allow a bigger working range equivalent to having a horizontal movement. The horizontal movement is a must in fixed loading tower(s) and a good point to have in mobile ones, especially if additional equipment is located on the same jetty. Another advantage depends on the ship’s hatch shape. The inclined movement helps to more efficiently fill the hatch. An example of the working area is depicted. products. When it comes to grain handling ContiTech offers a very dedicated product portfolio for this application. mining, machine and plant engineering as well as agricultural sectors like grain handling,” explains Dr. Michael Hofmann, Head of Advanced Belting Solutions at ContiTech Conveyor Belt Group. lifting heavier loads to higher elevations. “Our PVGE compound is specially designed to provide oil resistance and low temperature capability, for example –29°C, as well as static conductivity and flame retardant properties. They are used in a wide variety of grain handling applications and are available in both black and white colours depending on the customer’s needs. Additionally, the very strong interwoven carcass results in long belt life”, Hidalgo adds. The material is used for the newly developed PVGE 600 & PVGE 750 grain elevator conveyor belts. The high tensile strength belts are made with unique hybrid warp yarns and are designed to lift heavier grain loads or typical loads to higher elevations. The durability of the all-polyester interwoven carcass allows for exceptional bolt holding capability and fastener retention, as well as the flexibility to be used on systems with smaller pulley diameters. The PVGE compound delivers oil resistance and low temperature capabilities while meeting and exceeding safety standards. Depending on the application, textile conveyor belts feature various cover stock properties and a single- or multi-ply textile tensile member. These long-lived products are made for diverse conveying tasks in machine and plant construction as well as many other industries like grain handling applications. increase bucket projection by a minimum of 10%, which translates into great conveying capacity.” The conveyor belt is based on two compounds: Pathfinder Arctic and Pathfinder Supreme. Both compounds are designed especially for the grain industry where oily grains and controlled mineral or vegetable oil dust suppressive sprays come in contact with the belt. Supreme covers provide superior oil resistance to the potentially damaging effects of crushed and whole soybeans, oily grains and mineral oil dust suppressant sprays. ContiTech also focuses on conveyor belts for industrial applications — e.g. in cement plants, paper mills, the food processing industry, and storage warehouses — as well as special-purpose belts for agricultural machinery. “Selected compounds make our grain belts for example fire retardant and appropriate for elevation of oily conveying materials,” explains Christoph Seeger, Market Director Americas. The Grain Handler is engineered for use in the grain elevator industry or where a static conductive belt is needed. Different Impressions help with the transport of grain. For example, the company offers the Diamond Top Impression that is ideal for conveying products with mild oil content or a slight amount of oil in different carcass constructions. Furthermore, ContiTech offers a comprehensive range of belt profiles. For optimum performance even under the toughest of conditions all profiles are integrally moulded into the belt using rubber cleat extrusion. because it can cause material in transit to become discoloured and impure. For this reason, foodstuff conveyors are made from white nitrile (NBR) or styrene-butadiene rubber (SBR) and comply with international standards and norms governing the foodstuffs industry. Ronin Grain Management Solutions was established as a company in 2002 based on the industry need for improved risk management and inventory management solutions. Ronin engaged within the South African grain handling Industry providing analytical instrumentation catering towards safe storage and quality grading. Ronin soon established OEM (original equipment manufacturer) relationships with various international manufacturers for providing instrumentation to measure moisture, protein, fat, fibre and other constituents in cereal grains and flour. To this day Ronin plays an important role in terms of their national moisture calibration rollout programme which happens twice yearly accommodating summer and winter crop calibration validation. Amidst a time of deregulation of the cereal and oilseed control boards the need for improved day to day management of stock positions became more evident. Diverse trading methodologies were introduced into the newly formed free market which challenged any accountant to balance physical stock in the silo with what is happening on the book. During this time the ART® System was developed to be the first Inventory Management System to balance physical stock positions to transactional book systems on a daily basis. The ART® System utilizes a range of in-bin laser rangefinders which is connected over an Ethernet network to the silo office. The ART® Software sends requests for measurements or scans, if it is a laser scanning device, to calculate the occupied volume inside the silo. Full historic reference in terms of date and time of measurements are kept inside the ART® Software for each bin on site. ART® Head Office software, installed in the silo office or remotely somewhere else, correlates and interrogates the ART Software as well as the clients’ transactional database. All grading information like moisture, foreign materials, grading factors, bulk density and others are then applied by the ART® Head Office software on a weighted average basis per silo bin.The result being a daily stock position between what is in the silo and what is on the books. Today the ART® System is valued as one of the most important components at a bulk handling facility. The ART® System provides the needed information for production, logistics and traders to accommodate the time relevant decisions and product availability on site. Recent years saw the development of single and multi-axis 3D scanning lasers which can function as single units inside the silo bin to multiple scanning units making easy work of assessing big warehouses and flat stores. Ronin AIMS® software makes it possible to create the storage vessel in a 3D environment and to incorporate the intricacies of silo and warehouse design. Bin or warehouse shape, angular floors, discharge chutes, sweeping augers, temperature monitoring cables, partitioning walls, virtual segregation walls and the content bounds are all taken into account. By introducing a different laser class to the Artemis® laser scanner, Ronin unlocked a magnitude of industrial applications with the Artemis 300® series laser scanner. The Artemis 300® laser scanner provides open air; long range measurements on products with very low reflect ability. Ronin have an installed base of more than 2,000 measuring units which is used in grain silos, sugar warehouses, soybean meal plants, ammonium nitrate sheds, open air iron ore stacker, chrome stacker and more. Ronin Inventory Management System, IMS, situated in Richards Bay South Africa utilizes the Ronin propriety technology on a daily basis inside the South African port and mining environment to conduct moment in time audits, stock quantity and quality verifications on bulk commodities which is stored in silos, open warehouses and bunker bays as well as key-side laydown areas and stacker and/or reclaimer yards. Ronin runs a continuous development and accreditation programme in terms of hardware and software to enhance its clients’ experience as well as remote support functionality as well as to open up the more challenging environments of bulk handling. International distribution and establishing distributor agreements are core initiatives which are currently being focused on in various territories. CIMBRIA A/S, Denmark incorporated the ART® system with Artemis® 41 series laser scanners in their most recent project in Egypt. The ART system will provide daily knowledge on food security.